Toenail fungus is not only unsightly, but it can develop and cause major health risks if left untreated. Kerydin is an FDA approved topical treatment used to stop the growth of nail fungus. Kerydin (Tavaborole) is an oxaborole antifungal medication. It is specifically used for nail fungus due to Trichophyton mentagrophytes or Trichophyton rubrum. Kerydin is a topical solution (5%). Typically, toenails are infected more frequently than fingernails. First, clean and dry the infected nail(s), and then use medication with the provided dropper on the infected area once/day for 48 weeks. Slowly squeeze the medication to completely cover the nail. Use the dropper to spread the Kerydin over the entire nail to the edges, and under the tip of the nail. Repeat for each infected nail. After applying the solution, wait two minutes to let dry completely before wearing shoes, socks, etc. Wash hands with water and soap immediately after using the medication. Avoid getting the solution on other body parts. If this happens, wipe off with water. If used on a child, the adult should apply it for them. Continue treatment for the full time its prescribed. Nail fungus must be used for long periods of time so the healthy nails grow to replace the infected nails. Stopping medication too soon will allow the infection to return. Tell your doctor if the condition does not improve. Do not use if pregnant or nursing. Tell your doctor all medications you are currently using before using Kerydin. It is important to note that the toenail does not instantly become clear after getting any treatment. However, the fungus will die, and the results of this procedure will become more apparent when the new nail grows out. In many cases, people only need to get one treatment before they get the results they want. Some people have to return to Beaver Valley Foot Clinic for a follow-up treatment in order to ensure the fungus is gone. Laser treatments for toenail fungus removal can typically completed within 15 minutes. There is no drugs or anesthesia required for this treatment. Laser treatment is also painless. Additionally, laser treatment is very safe. Even though laser treatment is effective for killing fungus, a new fungal infection may still develop. People who are genetically predisposed to this disease are very likely to develop a new fungal infection. Patients with aggressive toenail fungus are often required to get periodic treatments. Laser treatment is considered a cosmetic procedure. That is why it is not covered by most health insurance plans. The cost of laser treatment can vary greatly. 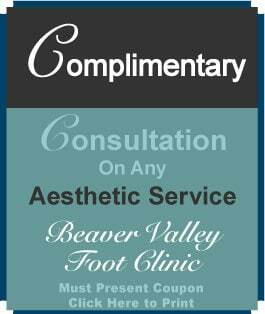 If you are interested in getting laser treatment for toenail fungus removal, then you should CONTACT US here at Beaver Valley Foot Clinic. 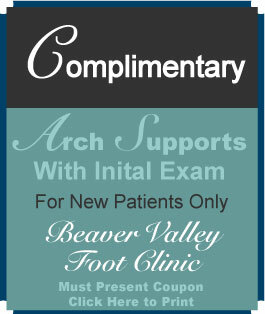 Our professionals at Beaver Valley Foot Clinic will be happy to answer any questions that you have. 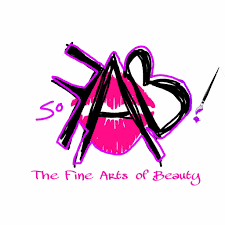 We are based out of Pittsburgh, PA.